Tringggggggggg…………. What, where, how??? It’s a dream!!! It’s just a %&*$ dream!!! Not again, why oh God! Why me!!! Why are you punishing me like this? Oh yes, this is what happens when you host any blog events. 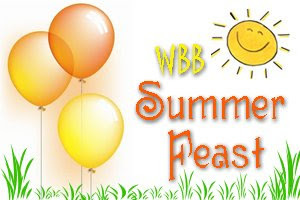 You don’t know when you will get hunger attack as the entries fill in your mail box any time of the day. If it’s close to lunch or dinner time, then you are finished!!! Imagine opening your mailbox just when you had to skip your breakfast because you forgot to set your alarm clock on a very important day at work, and find these delicious, mouth watering, drool-worthy entries there. Do I need to say anymore? 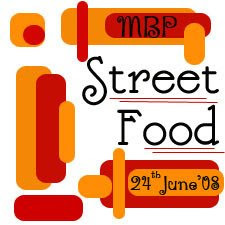 Since I announced Street Food theme for this month’s MBP, I have been getting lots of nightmares like this every night. There was only one way to get rid of it and that’s what I did this weekend. First prepare the potato filling. Heat a pan and add cumin seeds to it and dry roast for a minute. Then add cooked diced potatoes, green peas, garam masala, turmeric, salt to taste. Sauté on medium flame for a minute or two and keep it aside. Grind all the ingredients listed to smooth paste adding very little water at time. Adjust the number of green chillies according to taste. I personally like little hot. Make sure that the chutney is not very watery. Grind all the ingredients to very smooth paste adding very little water at time. If you find it difficult to grind, add small tomato (tip learnt from my favourite Chaatwalah). Beat the curd/yogurt till its smooth without any lumps. Now mix in powdered roasted cumin, sugar and salt to taste. Arrange 6-9 puris in a plate, making small opening on top of each puri big enough to add the fillings. First fill each puri with a tsp of Potato-Green Peas filling. Add one or 2 tsp of yogurt filling. Then fill it with ¼-½ tsp of all three chutneys. Drizzle over little more of yogurt filling and then sprinkle chopped red onion and sev on each puri. Serve this delicious plate of Dahi Batata Puri immediately as if kept for long it will become soggy. 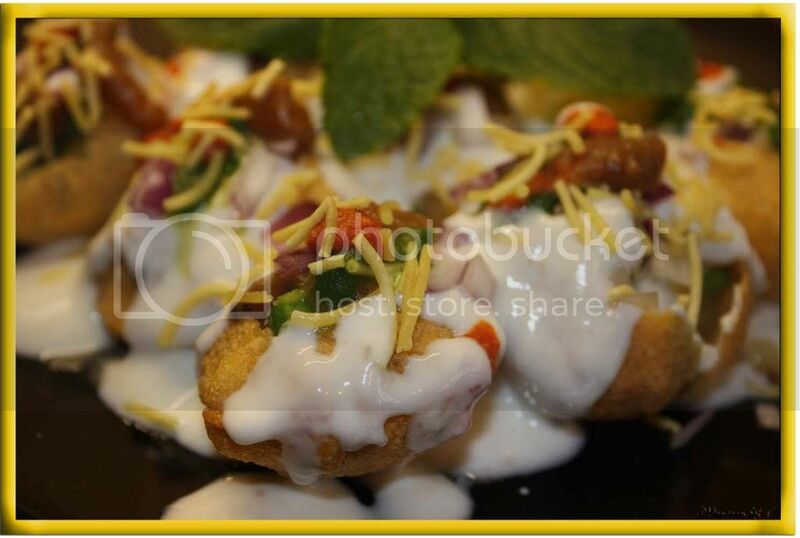 Remember to use your finger to eat it not with spoon and enjoy this finger-licking-ly delicious Chaat. TheDahi Puri is one of my fav chaats..Yours look just like the ones I get froma place called Gangothri In madras..
HeHe! Bam!!! I smack one on your head too along with God! Are you still dieting or not? Who cares? EAT CHAAT! Looks yummy, wish I could I could grab one off the screen. Our weekend very very busy, couldn't even sit down and eat, renovating the bathroom, big project. What a delicious dream that is.. I think i'm going to have the same dream after seeing your dahi batata puris - fabulous photos Sia. I love the way you have written Sia. It's so real, I have similar cravings for regular puris. The dish looks very good and inviting. That plate of dahi puri is wicked ! How long does the red chutney keep if you add tomatoes? Perfect! How much for a plate? :) if possible, pls fedex some.....:) now i am the next in line to get such nightmares!! pictures are gorgeous Sups! just feel like coming over to your place for some of the DBP! Yumm! Sorry i could not make it to the event, have been too swamped on the home front! Dahi Puri is my favorite street food, Used to have lots and lots of it back when I was in Hyderabad from the famous 'Gokul Chaat'. I hope I get all the ingredients like 'sev' and 'puri' here to prepare it at home..
umm...dahi batata poori is very tempting,looks delicious!! Dahi batata puri looks delicious Sia...if possible can u send me some? that looks awesome, Sia! Fantastic pictures.. 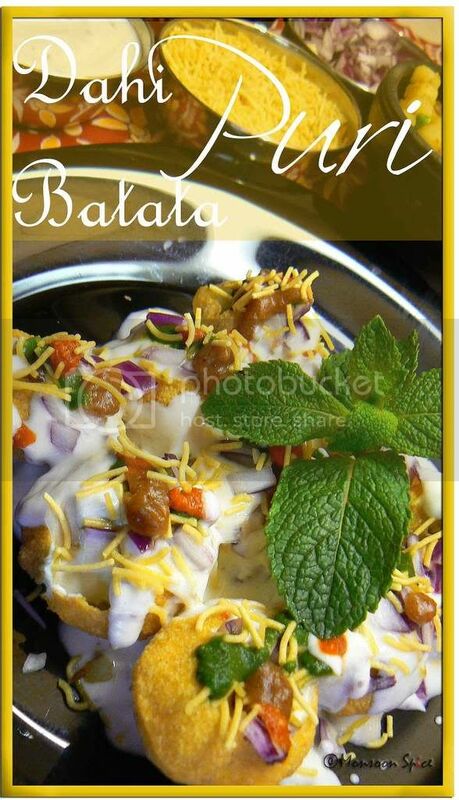 I'm a big fan of chaats, and I can't wait to try this now..
wow mouth watering dahi batata puri. Awesome pictures. yes, sia, i hear ya. sev is an oxidant-inch vegetable and one always needs to please with the bhaiya to sprinkle extra veggies on top. what a co-incidence i made same chaat item Sev Dahi Puri. Yet to post in my blog. Wow! Loved the pictures...and i am drooling over this plate of Dahi Batata Puri!! 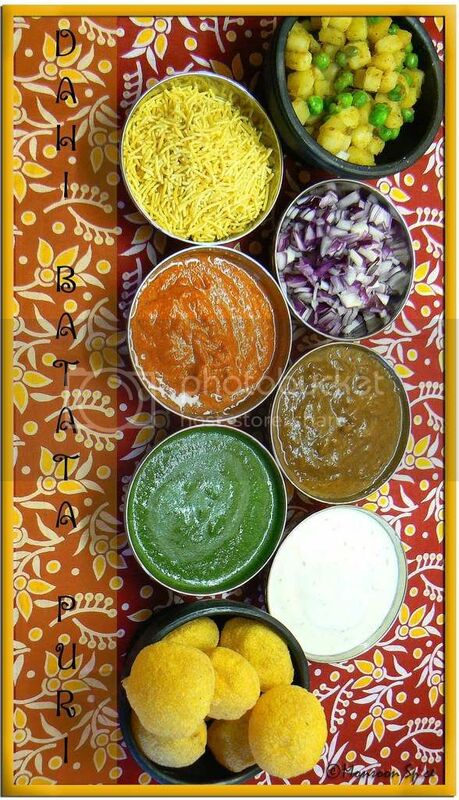 those dahi batata puris r mouth-watering ... making me crave to have some ... nice pics sia! its almost dinner time here, my 'palakoora pappu' is still in the cooker and meanwhile, I thought lets reply to the entries I have got for 'Yogurt' event! I was ignoring ur mail since morning, just becoz I know it wud be a torture to see the pic! ..and thats what happened.. I am salvating for ur Dahi Bata Puri.. and Off I am before I get hunger pands..hehehe! Thanks Sia, for ur gorgeous entry! pictures are so mouth watering. m feeling home sick now :(. ooh ! checking this post just at my breakfast time (sydney) !! bad idea .hehe. They look awesome and super tasty ! Oh, I love chaat, and am going to try this soon :) Thanks, Sia! Loved it Yum is my reaction.. for this.. 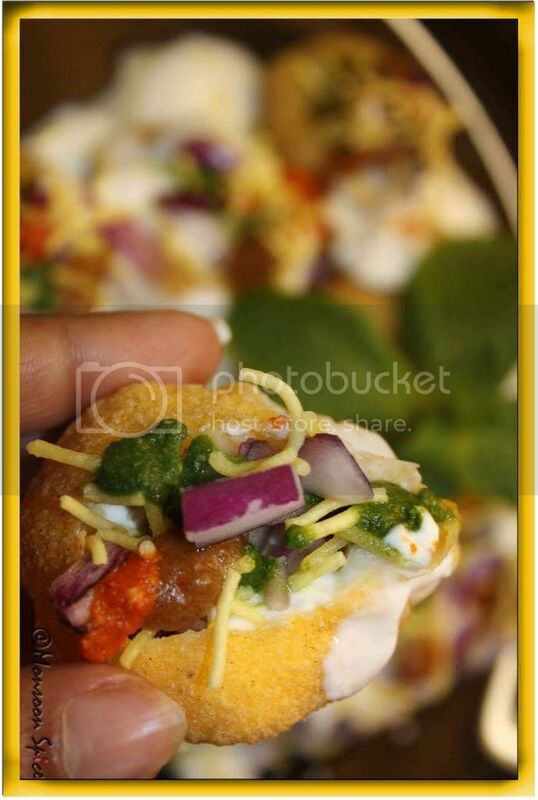 Loved the last click nice one..
Hummmm dahi batata puri looks awesome, mouth-drooling!!!! it looks so yummy.... !!! pass on some here now... :D .
I normally make chutney in large quantity to enjoy it quickly for few more days :) . hi this looks soo yummy!! I remember my college days in Pune - where its called SPDP. Sev Potato Dahi Puri! want it right now. Wow! That looks absolutely amazing!! Your recipes are amazing! They look so mouth watering and encourages people to try making them at home! There are so many many recipes posted on the net by so many people/chefs, but I find yours really delightful, especially with the colorful pics and garnishing, you really keep the ball rolling. Love all your recipes and trying hard to make as many as I can!